In Buffalo, New York, like in much of the U.S. Midwest, air temperatures are warmer than they usually are this time of year, thanks partly to a strong El Niño. Another result of the weather phenomenon’s influence is also a warmer Lake Erie, rivaling temperatures from back in the winter of 2012, according to the Buffalo News. 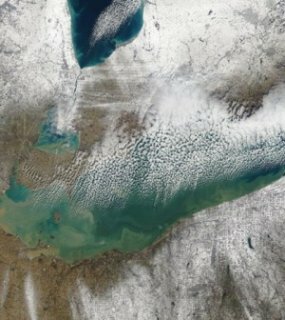 Although there are scant ice crystals forming around the shores of Lake Erie, the total ice cover is still less than 1 percent, as seen through satellite imaging. That’s the lowest amount of ice on the lake since Jan. 5, 2012, a year during which Lake Erie didn’t freeze at all. The lake’s current temperatures are holding around 40 degrees Fahrenheit. The rest of the Great Lakes are also feeling similar effects of the warmer winter conditions, with ice cover percentages down around the basin. Most of the ice that can be found appears concentrated in nearshore areas with more shallow waters that freeze quicker than those in deeper areas. Daniel covers monitoring, tech and everything in between as editor of the Environmental Monitor. You can also find his work on Lake Scientist and FishSens Magazine. Connect with him on Twitter @danielrkelly. Where is the Great Salt Lake located?